New York (CNN) -- For the first time since the terror attack on the World Trade Center, the general public is being allowed back onto the site. New York City Mayor Michael Bloomberg, members of the city council and some 9/11 victims' family members welcomed the first visitors to the 9/11 memorial plaza that opened on schedule Monday. "The opening fulfills a promise we made to the families on the 10-year anniversary and keep it open for them and the rest of the world forever to reflect on what happened and to honor the 9/11 victims and heroes," said Bloomberg, who is also the 9/11 Memorial chairman. Families of victims were able to visit the memorial Sunday during ceremonies honoring those who were killed in the September 11, 2001, attacks that brought down the twin towers. "We're so proud of this memorial," said Monica Iken, who lost her husband, Michael, in the attacks and was able to visit the memorial, along with other victims' families Sunday. "I can go see Michael. He's home." Monday's visitors passed through metal detectors and surveillance cameras as they began making their way to the the two huge, square fountains that mark the footprints of the World Trade Center towers. The fountains' water flows into granite reflecting pools at the center of the eight-acre, tree-lined plaza. Bronze plates surround the fountains and bear the names of the nearly 3,000 people killed in the 2001 attacks, as well as the six who were killed when a terrorist truck bomb exploded in the parking garage beneath the towers in 1993. Some of the visitors were visibly emotional as they walked into the plaza Monday. Some rubbed their fingers across the etched names of those who died. One man took out a paper and stenciled over a name and carefully rolled up the paper to take with him. 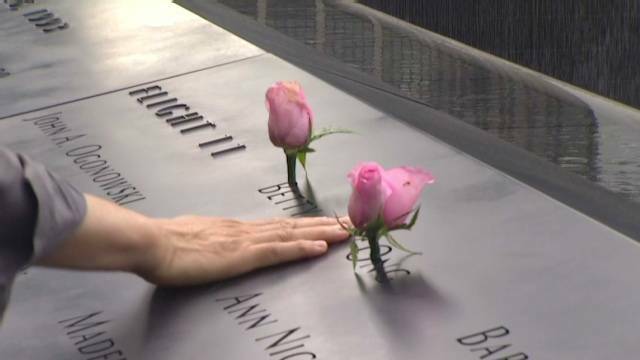 The names forming the perimeter where the North Tower stood are those who died in the building and the passengers on American Airlines Flight 11, which was crashed into it, as well as the six dead from the 1993 bombing. The South Tower site includes the names of dead who were in that building and United Flight 175, as well as the names of the first responders who were killed, the dead from the crash of American Airlines Flight 77 into the Pentagon, and the dead of United Flight 93, which crashed in a field near Shanksville, Pennsylvania. Anthoula Kastimades was there to greet visitors and spoke about seeing her own brother's name on the memorial. "It was difficult ... obviously, if I could have it any other way his name would not be listed." Kastimades brother, John, worked at Cantor Fitzgerald, on the 104th floor of the North Tower. His name is listed next to three or four people who worked at the same desk with him, day in and day out. By design, the placement of the names was given a lot of thought. Architect Michael Arad said the names are staggered, arranged not alphabetically but by something known as "meaningful adjacency." This way, Arad says, each name connects to another and "beyond a physical place, there is a relationship between one name and another." Input was shared by families of the victims so friends, family members, co-workers or people who commuted to work together were listed side by side. By doing so, more personal meaning was brought into the arrangement. Kastimades agrees. "It gives me comfort that he's listed with them in peace." She is also at peace with the memorial. Serving on the 9/11 Memorial board she worked tirelessly to get it right, especially for some 1,100 families, like hers, who have still not received loved ones' remains and consider the memorial to be sacred ground. "I feel the souls of the victims here," Kastimades said, "and I feel like John is here." The memorial has created an authentic place of loss; Kastimades says that sets it apart from any other memorial. "It's a wonderful feeling to know that we are with these beautiful souls." While the memorial is sacred to loved ones, it also is very important for the country, said Joe Daniels, president of the 9/11 Memorial. "I look forward to people coming here from around the world and sharing in this experience," he said. The memorial plaza will be open seven days a week, forever, Daniels said, though access will be restricted due to all the construction on other World Trade Center projects. Visitors must reserve a timed pass, which is free, through the memorial's website. More than 400,000 people from all 50 states and more than 70 countries have received passes at www.911memorial.org since the timed reservation system launched in July. Daniel said watching construction proceed on WTC 1, formerly known as the Freedom Tower, is part of the experience. "The tallest building in the United States is being constructed right in front of them," he said, pointing at the structure that eventually will rise to 1,776 feet. Besides marking what happened here, Daniels said, the site reflects the nation's commercial response and strength of will. "We can build bigger, build higher; that's the American way, and we're doing it." The memorial's museum is still under construction and is expected to open September 11, 2012.